A Baltimore man is currently hospitalized at Maryland Shock Trauma in a medically induced coma with spinal injuries after an arrest by police Sunday, WJZ reports. 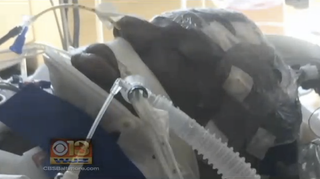 According to the news station, 26-year-old Freddie Gray’s condition raises question about what happened to the young man after his arrest that landed him in the hospital. Still, Gray’s family says, that does not explain his current condition. “His face is swollen. He just looks really horrible. Like I said, he’s in an induced coma. We’re all praying,” his stepfather said. Cellphone footage from the encounter with city police show the final moments of Gray’s arrest. Gray screams as if in pain as officers take him away. Baltimore City Police Deputy Commissioner Jerry Rodriguez acknowledged seeing the recording but said that at no time “did I see a use of force” by officers in the video. Rodriguez would not say why officers stopped Gray, whom he did not identify by name. According to WJZ, the police are trying to close the gap in time between the arrest and Gray’s arrival at Shock Trauma to figure out how the young man was critically injured. The officers involved in the arrest are currently on administrative assignment, WJZ notes.